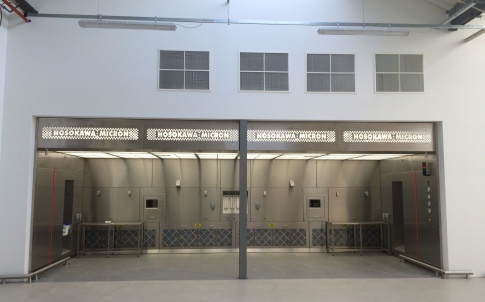 When creating a new manufacturing facility, Hosokawa Micron’s customer sought their advice on the best system options for charging a reactor vessel with bulk powders while ensuring that operators and surrounding areas are not exposed to the powder. The reactor vessel is installed in a room along with several other vessels with limited space for local bulk powder charging. 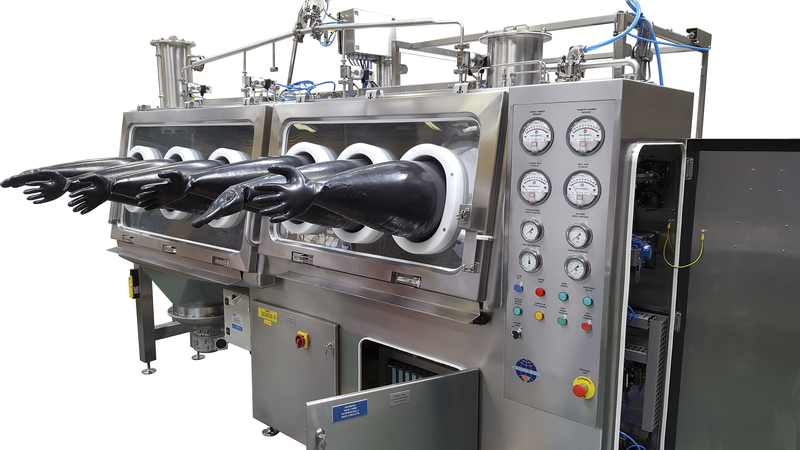 After some discussion it was agreed the best solution was to install a powder handling isolator in a dedicated charging room and convey the powder to the reactor using an integrated vacuum transfer system. Drums are loaded onto a pneumatic drum tipper which rotates and docks the drum into the rear of the isolator where it is sealed using an inflatable seal. The drum outer liner is pulled into the isolator and sealed onto a spigot on the rear wall with a second inflatable seal. 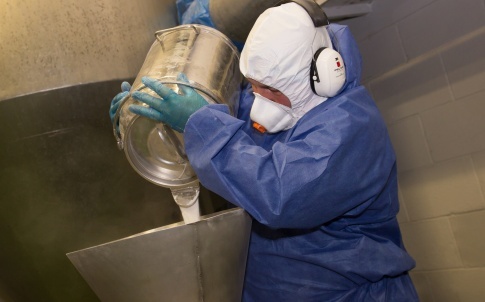 The inner bag, containing the powder is then pulled from the drum into the isolator transfer chamber before being moved through the transfer door into the charging chamber. 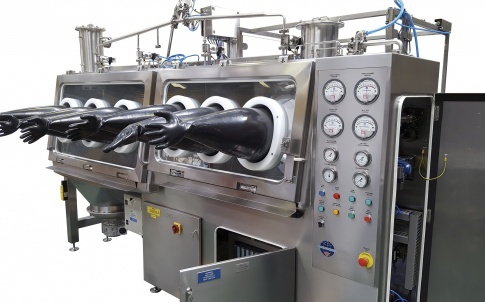 Engineers at Hosokawa Micron designed the isolator so it is possible to pre-load 6 x 20kg bags of powder before the powder transfer operation is started. 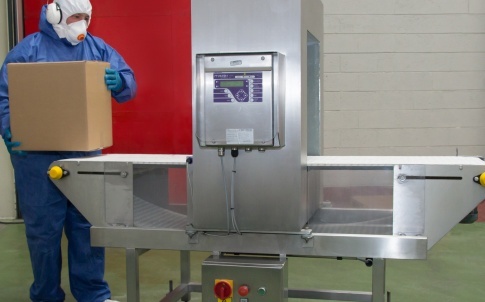 This ensures that the transfer of the whole 10-bag batch takes place within 50 minutes. This is the time limit required to achieve the correct process conditions inside the reactor. 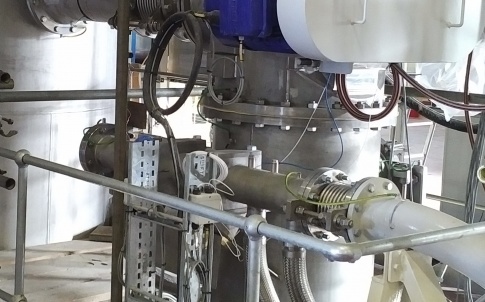 The vacuum transfer unit is mounted directly onto the reactor vessel inlet and is connected to a vacuum pump installed in the nearby technical area. The vacuum transfer unit inlet is piped to the outlet of the isolator charge hopper. At the bottom of the charge hopper a bridge breaker is installed which helps to keep the powder in the hopper moving towards the outlet pipe. During normal operation, the isolator internal pressure is maintained at around -100Pa using a variable speed centrifugal fan and pressure transmitter but the isolator gas inlet supply also passes through a vacuum breaker valve which ensures that the correct internal isolator pressure is still maintained when the vacuum pump is running. 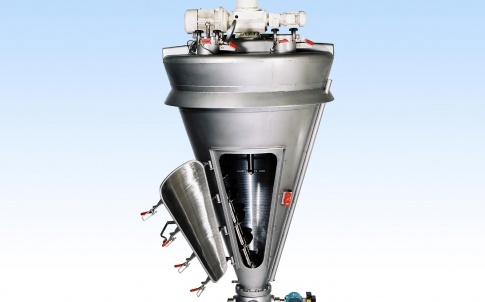 A dense phase powder transfer takes place, powder is sucked into the vacuum transfer unit until it reaches a pre-set level, at this point the inlet valve is closed and the bottom outlet valve is opened to allow the powder to discharge, under gravity, into the reactor. The discharge is also aided by a pulse of high pressure nitrogen through the VTU filters. The discharge valves then close and the cycle is repeated until all of the powder has been transferred. The isolator and transfer system is nitrogen inerted and designed to comply with ATEX regulations. The system is operated via a touch screen HMI and incorporates interlocks to ensure operator safety. Hosokawa Micron is a leading innovator in powder processing technologies, pioneering new and unique, engineered solutions that deliver product, market and financial advantages for customers.